Defib Pads For The Powerheart G5 - View Online At Real Response! Whether you need replacement pads or want a spare set available for large scale emergencies, the Cardiac Science powerheart G5 Defib Pads are your answer. These electrode pads are pre-connected to make useage simple and to save time in emergency situations. Each pad has large easy to read placement instructions so anyone can accurately adhere the equipment to the body. 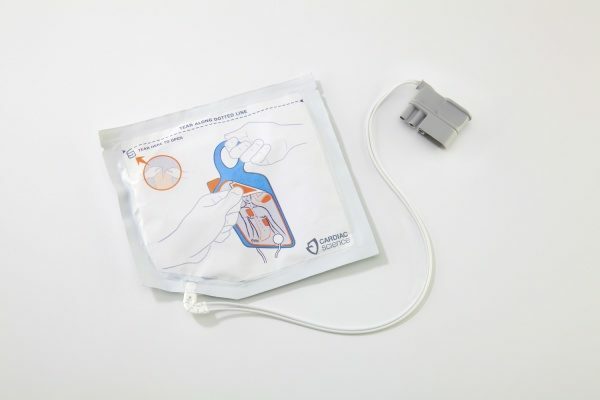 Stored in a foil packet that keeps the defib pads clean and safe, the pads have easy, clear peel corners so that critical time is not wasted removing plastic coverings. Defib pads have a 2-year shelf life. These defib pads should always be a part of your first aid kit. Once they have been connected the machine will regularly check the pads through the automated self tests. This means that you will be alerted to any connection faults and can trust that the equipment will always be ready to use. The pads are designed to improve the speed of response. The easy-to-peel top corner means no fiddling to remove the plastic covering on the stick adhesive. This adhesive ensure that the defib pads will stay firmly on the body so that the defibrillator can read the heart’s rhythms and supply the required electrical pulse. Sudden cardiac arrest response requires the use of a defibrillator if there is any hope of saving a victim from severe damage to the body and mind, and the extremely high probability of death. Sudden cardiac arrest kills 15,000-20,000 Australians each year. There is a serious problem with the speed in which the Chain of Survival is completed in the fact of such an emergency incident. The Chain of Survival are the steps to be taken to increase the chance of survival of a victim of sudden cardiac arrest. They are: – Early access – Early CPR – Early defibrillation – Early advanced care The key element to this chain is the ‘early’ which is paramount in sudden cardiac arrest because of the speed with which an attack damages and ultimately kills the victim. Brain damage will occur between 4-6 minutes of an arrest with death following soon after. However, if defibrillation was able to be applied to a victim within the first minute of an attack, it is estimated that survival rates would increase to 70% from the 2%-5% at where they currently stand. This is because a defibrillator, as a device that applies electrical pulses, works directly against the cause of a sudden cardiac arrest. Sudden cardiac arrests are caused by the malfunctioning of the heart’s electrical system, which stops the blood flowing around the body. A defibrillator will measure the heart’s rhythm through the pads attached to the body, and then apply the appropriate electrical pulse to correct the beat of the heart. The causes range from heart disease and underlying heart conditions, to drug use, both prescribed and illicit, and severe trauma, meaning that people of any age can become victims, not just the elderly. Having a defibrillator that is ready for action in the case of medical emergency is critical. Your Cardiac Science powerheart G5 Defib Adult Pads have a two year shelf-life if unused. They are top quality and simple to use, with clear placement instructions. Ensure your peace of mind with your Cardiac Science powerheart G5 Defib Adult Pads.